1) Instead of a healthcare reform to slow cost increases, Democrats in the Senate seem to be converging upon an expansion of Medicare to include age 55-64 year-olds….Republicans could have been architects of improvement, instead we made ourselves impotent spectators as things get radically worse. Plus — the bad new Democratic proposal will likely be less unpopular with voters than their more promising earlier proposal. Nice work everybody. 2) House and Senate conferees last night rejected a proposal to deny EPA funds to enforce its new powers over greenhouse gasses. So instead of an economically rational approach to carbon abatement — a carbon tax or even a cap-and-trade system stripped of the abuses and boondoggles attached to it by House Democrats — we’re going to have the least rational approach: bureaucratic enforcement. 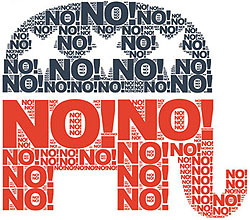 The furious rejectionist frenzy of the past 12 months is exacting a terrible price upon Republicans. We’re getting worse and less conservative results out of Washington than we could have negotiated, if we had negotiated. Roughly speaking, I think Frum is right. The Republican strategy is high-risk/high-reward. If it works, then no legislation is passed and they get everything they wanted. But if it doesn’t, they get a far worse deal than they could have gotten if they’d bargained. But I’d a few caveats to Frum’s specifics. First, the healthcare bill could have been improved only if Republicans had proposed serious cost-control ideas within the basic Democratic framework. After all, Democrats won the election, and the very least they expect is to be able to dictate the basic framework. But it’s not clear to me that Republicans even have any ideas along those lines. It’s possible that they could have bargained for, say, some tort reform concessions, but how else would they have cut costs? There’s no one in the GOP seriously in favor of sticking it even harder to doctors, insurance companies, Big Pharma, or the elderly. So what would they have proposed? Their pet ideas (HSAs, gutting state regulations, etc.) don’t really fit within the Democratic framework, and to be honest, their support for these ideas has always been so ephemeral and opportunistic that I’m not sure they care about them very much anyway. It’s hard to believe that they genuinely believe in any of this stuff enough to bargain their votes away for it. The EPA endangerment ruling is a different kettle of fish. My sense is that the Obama administration has no real desire to use the Clean Air Act to regulate greenhouse gases. The reason they’ve moved ahead quickly on the endangerment finding isn’t because they really want to implement it, but precisely because they think it’s a good stick to get some Republican support. The message is: you might not like cap-and-trade, but if you scuttle it you’re going to get something worse. So why not work with us? So far, then, conservatives haven’t really lost anything on this front. They’re just being confronted with some hardball politics. As with healthcare reform, though, I wonder what Republicans have to offer. It’s true that cap-and-trade was originally a conservative idea that was largely adopted by liberals after it proved itself in the case of acid rain, which means that theoretically Republicans ought to be able to support it. But the “boondoggles” that have been attached to it haven’t really been ideological. They’ve been cave-ins to corporate and regional interest groups. What are the odds that Republicans would help resist that kind of pressure? Still, Frum does have a point: Democrats are genuinely anxious to have a few more votes for both the healthcare bill and the climate bill, and I’m pretty sure they’d be willing to bargain away a fair amount in exchange for a vote. So I’m curious: within the basic Democratic framework of these two bills, what kind of deals does Frum think Republicans could plausibly make that would be worth trading their vote for? This is a real, not a rhetorical or snarky, question. Given the current state of the conservatism,1 it’s hard to see what they’d be. 1Which, admittedly, is Frum’s whole point. There are no deals to be made until conservatives start getting serious about governance again.